David Lovell, PI for the Maryland portion of the grant. NEXTOR, the National Center of Excellence for Aviation Operations Research, has received a two-year, $1.04 million grant from NASA to evaluate methods of relieving the nation’s overburdened aviation system through improvements to its air traffic control system. “Advanced Stochastic Network Queuing Models of the Impact of 4D Trajectory Precision on Aviation System Performance” will build a large-scale stochastic queuing model of the national airspace system that will allow the Federal Aviation Administration to estimate improvements in performance metrics and reliability afforded by individual technological enhancements to the air traffic control system. Such enhancements could include time-based metering, performance-based services, and paired operations on closely spaced parallel runways. The principal investigator for the grant is Mark Hansen, professor of civil and environmental engineering with the Institute for Transportation Studies at the University of California, Berkeley. The University of Maryland, MIT and Intelligent Automation, Inc. (IAI) of Rockville, Md. are the subcontractors. 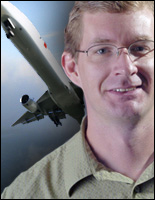 Associate Professor David Lovell (CEE/ISR) is the principal investigator for the Maryland portion. Several ISR alumni hold senior positions at IAI. Currently, air traffic controllers are often unable to predict exact arrival times of aircraft, leading to delays and causing aircraft to circle above airports because of traffic backup on the ground. The researchers will develop models and algorithms that address the problem of how to schedule and route planes so that the delay on the entire system is minimized. One idea being considered is to contract with pilots to land at a certain place at a given time. If the pilots meet their contracts, they would be given priority landing times.